Park on a level surface and apply the parking brake. Move the shift lever to P (Park). Make sure the parking brake is securely applied and the shift lever is shifted into P (Park). Be sure to block the wheel as the vehicle may move and result in personal injury. 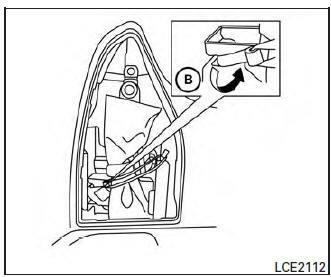 Open the rear liftgate. Remove the Divide-n-Hide floor. For additional information, refer to “Dividen- Hide adjustable floor” in the “Instruments and Controls” section of this manual. The jack and tool kit are located in the storage compartment to the left. Remove the storage door by pressing the two release tabs A simultaneously. Unhook the clip B restraining the jack and tool kit. 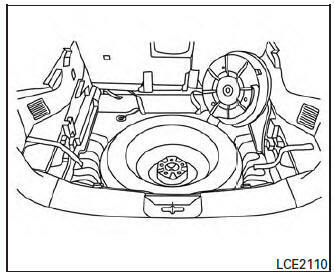 To loosen the bolt, turn counterclockwise. Once loosened, remove the bolt. 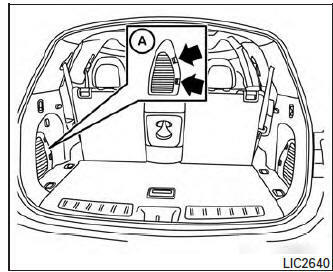 Once the flat tire is exchanged with the spare tire, store the flat tire where the spare tire was located. Turn the bolt clockwise to tighten. 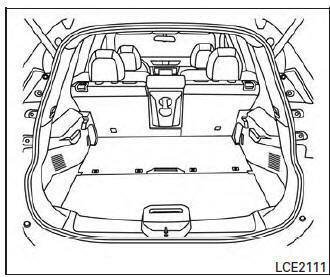 Place the sub-woofer in the upper right corner of the trunk, leaning against the 2nd row passenger side seat. 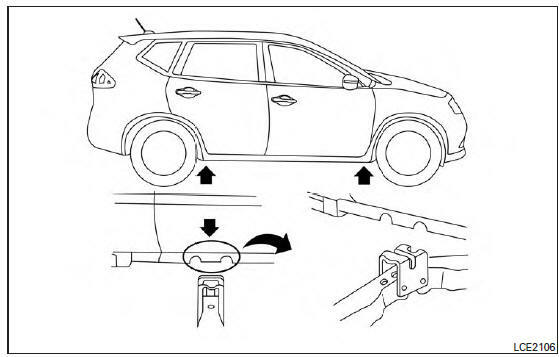 Once the flat tire is exchanged with the spare tire, store the flat tire where the spare was located. Place the sub-woofer inside the flat tire. 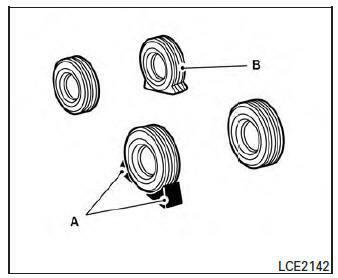 With the wheel nut wrench, tighten wheel nuts alternately and evenly as illustrated until they are tight ( A , B , C , D , E ). Lower the vehicle slowly until the tire touches the ground. 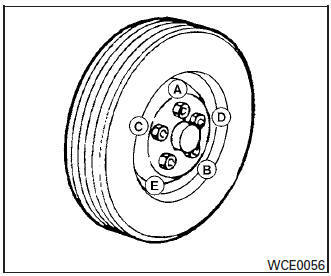 Then, with the wheel nut wrench, tighten the wheel nuts securely in the sequence illustrated ( A , B , C , D , E ). Lower the vehicle completely. Securely store the jacking equipment in the vehicle. When storing the tool kit, it is requested to tighten the bag securely with the attached band to prevent movement of the tools, otherwise noise may occur. Retighten the wheel nuts when the vehicle has been driven for 600 miles (1,000 km) (also in cases of a flat tire, etc.). The wheel nuts must be kept tightened to specification at all times. 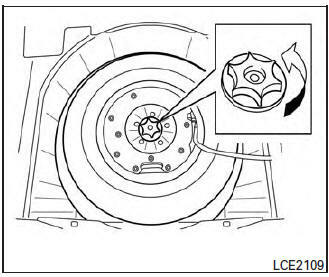 It is recommended that wheel nuts be tightened to specifications at each lubrication interval. COLD pressure: After vehicle has been parked for 3 hours or more or driven less than 1 mile (1.6 km). 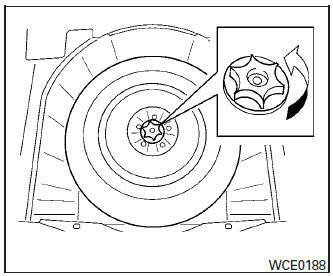 COLD tire pressures are shown on the tire and loading information label affixed to the driver side center pillar.